Some readers will know that I write a regular ‘how-to-play’ article for Pianist magazine; If you’ve yet to discover this magazine, you can find out much more here. My article focuses on elementary level pieces for students of around Grade 1 – 3 level. It’s actually called a ‘beginners how-to-play’, but in reality few students start with such repertoire. Our audience is mainly adult amateurs, teachers and students, and I always appreciate your kind comments (and there are many!) regarding the magazine and my articles when I visit various parts of the world, adjudicating and giving workshops. Around 900 words in length, my column aims to shed some light on the style of each chosen work whilst offering some detailed practice ideas. Pianist magazine ensures that readers can listen to and play each piece, and every edition contains the score of the piece and a recording, which is played by Chinese pianist Chenyin Li. A particularly wonderful aspect of my brief is that it has brought me in contact with the music of a myriad of lesser known composers. In this respect it has been a real education. Magazine editor Erica Worth and I are constantly searching for suitable material and this has led to the discovery of whole collections of various educational piano pieces. Always mindful of the level and difficulty of the piece, occasionally we unearth a composition which may be slightly trickier than the expected level, but which we feel just must be included. The featured piece in Pianist magazine edition 105 was one such piece. Etude Op. 97 No. 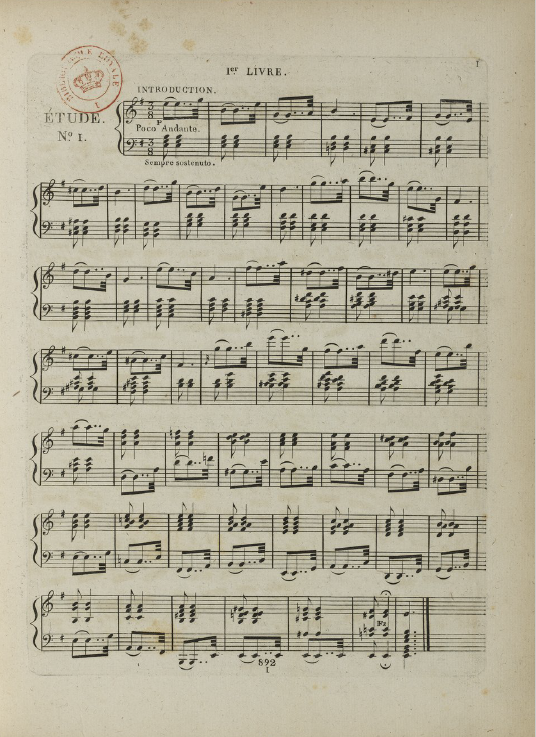 1 (see above image) was written by Anton Reicha (1770 – 1836), who was a friend and contemporary of Beethoven; the two composers studied at the University of Bonn together. Reicha is probably best known for his wind quintet literature and the important role he advocated as a teacher, numbering Liszt, Berlioz and Franck amongst his pupils. He wrote treatises on various aspects of composition and theory, but due to his apparent aversion to being published, his music largely fell into obscurity soon after his death, and his life and work have yet to be studied in detail. Reicha contributed to the piano repertoire via a series of fugues and etudes, as well as larger scale works, including a set of variations lasting over 45 minutes in length. Inventive and imaginative, he was an early advocate of polytonality and asymmetric meters. Reicha’s fugues were also renowned for breaking the usual strict rules. However, his music is predominantly tonal, with a spontaneous quality, and his scores are relatively free from the ubiquitous composer’s musical directions, leaving interpretation solely to the performer. The Etude Op. 97 No. 1 is an extremely beautiful, contemplative little piece; the melody largely floats serenely above a series of repeated left hand chords, and then roles are reversed later in the piece. This Etude is an exercise (or a study) in balance between the hands, chordal balance and cantabile. Yet ultimately, it’s all about developing an elegant, personal reading with a depth of colours via a rich sound and judiciously balanced phrases. Irrespective of your level as a player, I urge you to consider playing this piece, if only to revel in the delectable harmonic twists and turns combined with a simply delicious melodic line. You can enjoy pianist Ivan Ilic’s performance by clicking on the link below. To subscribe to Pianist magazine, click here. If you would like to purchase and download the music for this piece, click here.